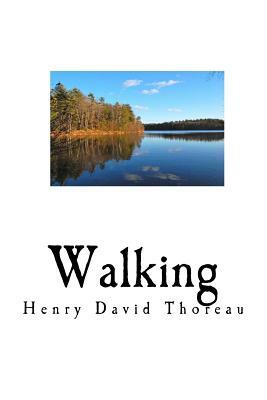 Walking by Henry David Thoreau - Walking, or sometimes referred to as "The Wild," is a lecture by Henry David Thoreau first delivered at the Concord Lyceum on April 23, 1851. Written between 1851 and 1860. Thoreau read the piece a total of ten times, more than any other of his lectures. "Walking" was first published as an essay in the Atlantic Monthly after his death in 1862. He considered it one of his seminal works, so much so, that he once wrote of the lecture, "I regard this as a sort of introduction to all that I may write hereafter." Thoreau constantly reworked and revised the piece throughout the 1850s, calling the essay Walking. "Walking" is a Transcendental essay in which Thoreau talks about the importance of nature to mankind, and how people cannot survive without nature, physically, mentally, and spiritually, yet we seem to be spending more and more time entrenched by society. For Thoreau walking is a self-reflective spiritual act that occurs only when you are away from society, that allows you to learn about who you are, and find other aspects of yourself that have been chipped away by society. "Walking" is an important cannon in the transcendental movement that would lay the foundation for his best known work, Walden. Along with Ralph Waldo Emerson's Nature, and George Perkins Marsh's Man and Nature, it has become one of the most important essays in the environmental movement.